Just Dyke Diary entries here: the News (and Media and People content) are in the Kohi-tātea/January (archive) page. Thursday 26 to Saturday 12 December Re-Reading the Rainbow a snap shot of where contemporary rainbow arts has arrived in 2015. Rm Gallery (first floor, 307 Karangahape Rd, Newton (entrance on Samoa House Lane off Beresford Street); open Thursdays and Fridays 1-6pm, Saturdays 12-4pm. Visit gallery website for details including artist talks and workshops. Sunday 29 Drawing In Drawing Out (opening, 2pm) Charlotte Museum. A collection of around 100 self-portraits by five contributing North Island artists: recent work from Fran Marno, Beth Hudson, Star Sherret, Therry Weertz and Nadia Gush. Friday 4 Women Talk and AGM with law lecturer and researcher Khylee Quince (Te Roroa, Ngāpuhi, Ngāti Porou), 5.30pm, includes dinner, Auckland Women’s Centre. AGM open only to members but you can join on the night, $5 unwaged/$20-$50 waged. RSVP by Friday November 27 to info@womenz.org.nz or phone 376 3227 x 0. Saturday 5 Westie Lesbian Ball 8pm, 1930s theme, starts with a free drink and cocktail hour, includes the Muse and Jodi Pringle playing live covers, followed by supper and DJ Kel playing dance music into the wee small hours. Shed 1, Corban Estate Art Centre, Henderson. Tickets from the Women’s Bookshop or email lesbianball@gmail.com, $90. Sunday 6 Dyke Hike: Mokoroa Stream Track, Waitakere. This loop walk involves a lot of stream crossings as we walk alongside the Mokoroa Stream up to the waterfall through mature bush. Be prepared to get wet feet! The stream can be high after substantial rain. There is one short rock climb on the track. Meet at the end of Horseman Rd, Waitakere. Time: about 3 hours. Grade: Moderate (boots recommended, expect a few hills and stream crossings are possible). Email hike@lesbian.co.nz, visit www.lesbian.co.nz. Wednesday 9 alba, 6-8pm, The Tiny Theatre, Garnet Station café, members free, non-members $10, see Facebook for details. Sunday 13 Rainbow Youth Xmas Party 2015 12-3pm, 281 Karangahape Rd, Newton. Potluck lunch so bring a dish to share, or some yummy snacks and drinks. Celebrating RY volunteers and 2015 highlights. Wednesday 16 Fifth Season Garden Group Xmas dinner from 7pm, dinner approx. 7.45pm. Valentines Restaurant, corner Ewington and Dominion Rds, Mt Eden. $32.90 per head payable at the door, bring extra cash for additional drinks; door prizes. Sunday 20 Coffee & Stroll 10am, coffee at Sand Dunz Beach Cafe, 455 Motutara Rd, Muriwai; 10.30am, a stroll along the beach … but first, a walk to look at one of the few mainland gannet (takapu) breeding colonies: we should be able to see lots of adults and young birds. No dogs on this occasion. Friday 25 LGBTQIAP Orphans Xmas Beach Picnic Pt Chevalier, 11am-4pm. If you have no whanau to spend xmas with coz you are Takataapui/Fa’afafine/Akava’ine/Fakaleiti, LGBTQIA you are welcome to join us for a chilled summer day. BYO everything for a day at a dog friendly beach. Details on the Facebook event page. Thursday 3 Lesbian Social Group drinks from 5.30pm, Good Home Bar, 27 Hood St, Hamilton. Cocktails, a sunny garden bar, live music and great company. See the LSG Facebook page. 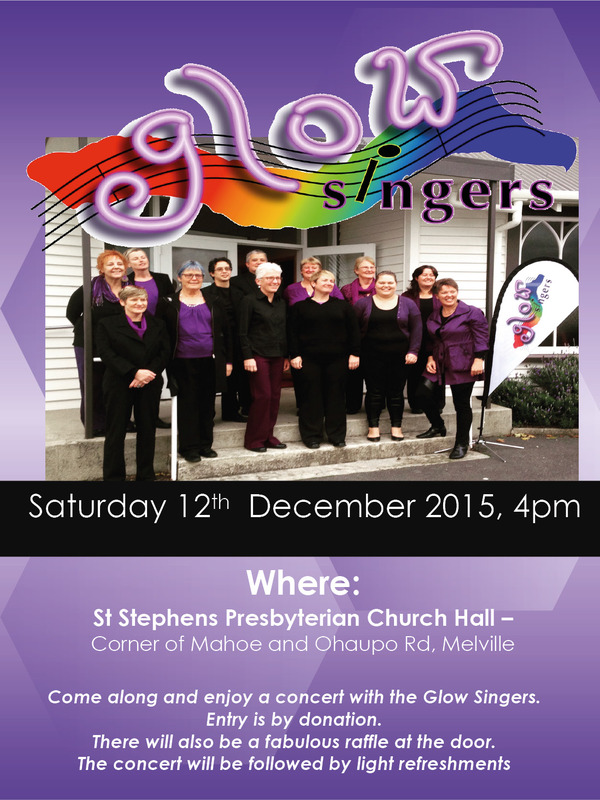 Saturday 12 GLOW singers concert 4pm. St Stephens Presbyterian Church Hall, corner of Mahoe St and Ohaupo Rd, Melville, Hamilton. Tunes by the Beatles, Adele, ABBA and more. Koha, includes light nibbles afterwards. Bring raffle money. Friday 18 Wairarapa Pink drinks, Buckhorn Bar & Grill, 20 Memorial Square, Carterton. From 6.30pm, earlier in the month because of Christmas. All welcome, friendly crowd. Snacks and meals, usual range of drinks/coffees. If you don’t see us in the main bar walk through to the room off it on the way to the garden bar. Sunday 20 Lesbian Social Group Christmas in the park from 4.30pm, Hamilton Gardens, on the Rhododendron lawn next to Turtle Lake. Part of Gourmet in the Gardens; bring a rug or camping chairs, pack a picnic dinner or buy from on site food caravans, live music. Look for the Santa hats and rainbow flag – children welcome. See the LSG Facebook page. Tuesday 1 Proud 2016 Conference Launch community meeting St John’s in the city, corner Willis and Dixon Sts, 5.30-7.30pm, groups and individuals who are thinking about or already planning on marking the anniversary year (30 years since Homosexual Law Reform) or wanting to join in and be involved with the conference in the Wellington region are encouraged to attend. Visit the event Facebook page or webpage for details. Thursday 3 An evening with the Topp Twins Comedy, stories and songs, with appearances by the Kens and the Bowling Ladies, St James Theatre, 8pm, see Ticketek. Sunday 6 DANSS dancesport classes Beginners revision, 7pm, intermediate revision, last class of the year, 8pm, for LGBTT people and friends, partners not necessary. Upstairs, Thistle Hall, cnr Cuba & Arthur Sts, email danssnz@outlook.com or see Facebook. Hummingbird Eatery & Bar, 22 Courtenay Place Hosted by WIG Entertainment with Amanduh La Whore, Felicity Frockaccino and Poly Filla. $60, fundraising for Wellington Pride Parade 2016, see event page. Restaurant 88, 6.30 for 7pm start, $50, cash bar. Pay by internet banking to RW account 03-0566-0164688-000, using Rest88 Your Name in the reference boxes. 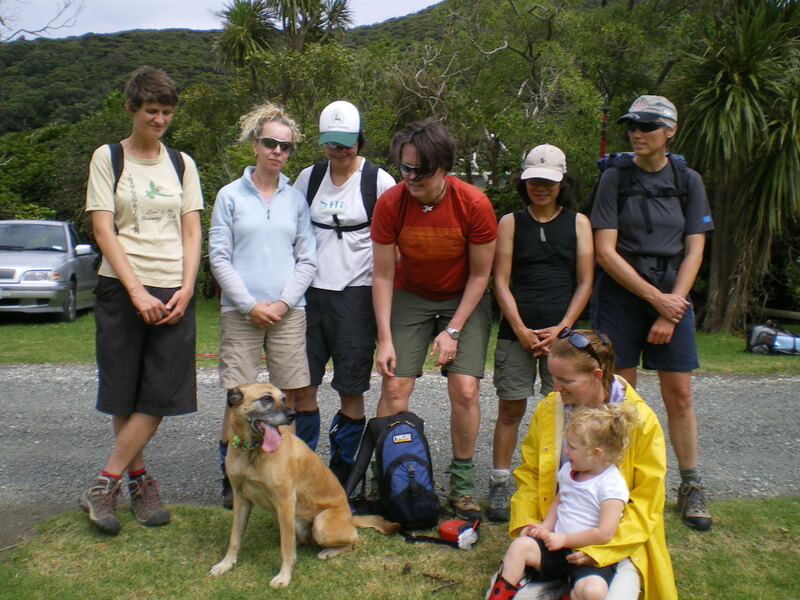 Sunday 13 Lesbian Overland and Cafe Club walk to Percy’s Reserve, Lower Hutt. Meet 10am at Wellington Railway station or 10.30am at Petone railway station. Text Lainey for car shares, 022 646 3393. Wednesday 2 Pool @ Shark Club, 132 Bridge St, Nelson, from 5.30pm. Email The Lesbian Connection (TLC) at tlconnection.link@gmail.com to go on mailing list or for more details. Saturday 5 from 3pm to Sunday 6 Gals pre-Christmas Camp Out, McLeans Recreation Area, State Hwy 61, near Woodstock. Large area, sheltered with loads of space underneath the trees (or out in the open) for camping and right next to the Motueka River. Not usually too busy, especially at this time of year. Email The Lesbian Connection (TLC) at tlconnection.link@gmail.com for more details. Sunday 6 brunch/lunch, Sinful Coffee, 276 Queen St, Richmond, 11am. Email The Lesbian Connection (TLC) at tlconnection.link@gmail.com to go on mailing list or for more details. Wednesday 9 Games Night, Prince Albert Hotel, 113 Nile St, Nelson from 5.30pm. Email The Lesbian Connection (TLC) at tlconnection.link@gmail.com to go on mailing list or for more details. Friday 11, dinner, Chokdee Thai Cuisine, 89 Hardy St, Nelson, 7pm. Reservations to be confirmed by December 7. Email The Lesbian Connection (TLC) at tlconnection.link@gmail.com to go on mailing list or for more details. Wednesday 16 Pool @ Shark Club, 132 Bridge St, Nelson, from 5.30pm. Email The Lesbian Connection (TLC) at tlconnection.link@gmail.com to go on mailing list or for more details. Sunday 20 brunch/lunch, T.O.A.D Hall Store and Cafe, High St South, Motueka, 11am. Email The Lesbian Connection (TLC) at tlconnection.link@gmail.com to go on mailing list or for more details. Wednesday 23 Games Night, Prince Albert Hotel, 113 Nile St, Nelson from 5.30pm. Email The Lesbian Connection (TLC) at tlconnection.link@gmail.com to go on mailing list or for more details. Wednesday 30 Pool @ Shark Club, 132 Bridge St, Nelson, from 5.30pm. Email The Lesbian Connection (TLC) at tlconnection.link@gmail.com to go on mailing list or for more details.